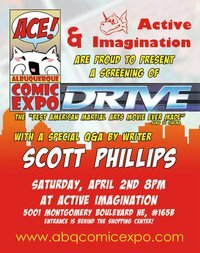 The fine folks behind the Albuquerque Comic Expo are hosting a free screening of the director’s cut of Drive (1997) this Saturday, April 2, 2011, at 8:00 PM at Active Imagination in Albuquerque. Drive was directed by Steve Wang, written by me, and stars Mark Dacascos, Kadeem Hardison and Brittany Murphy. Kung Fu Cinema recently named the flick “The Best American Martial Arts Movie Ever Made.” The director’s cut is about 15 minutes longer than the US release and features a completely different score. The entrance is on the back side of the shopping center with Burlington and Anchor Blue. Look for the Active Imagination sign.